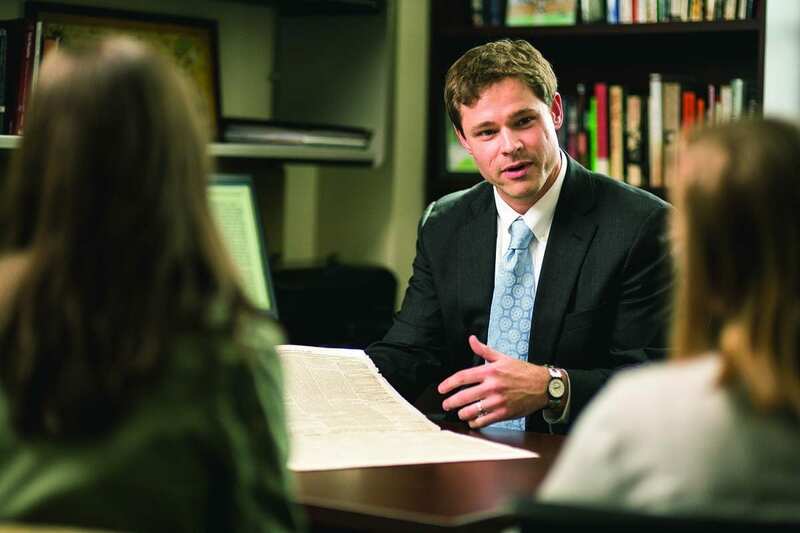 Dr. Edward E. Andrews ’01 meets with students in his office in the Ruane Center for the Humanities. I love walking to work in the morning. Now, people may see that as a cliché, but I mean it sincerely, both in terms of truly loving my job but also really, actually, physically walking into work. As I stride by the DWC seminar rooms and into my office in the Ruane Center for the Humanities, I get to pass by Vance Morgan explaining the rise of Stoicism, or Robin Greene spinning a hilarious tale about the origins of a funky Greek word, or Steve Lynch showing how the structure of the Globe Theatre shaped Shakespearean tragedies. I don’t loiter or eavesdrop. That would be creepy. But every single day I get to catch tiny, inspirational glimpses of the amazing education my colleagues are offering our students. I love walking into work because I get to see PC professors doing what they do best. And, trust me, they are masters of their craft. It’s hard to believe, but I’ve been a Friar for more than half my life. I first came to PC in August 1997, a kid from New Hampshire with no clue about, well, anything. But I got lucky. I was fortunate to be taught by the titans of Providence College: Rodney Delasanta, Donna McCaffrey, Jim McGovern, and others. Under their guidance, I gained not only confidence, but also, direction and a sense of purpose. My experience here as a student was truly transformative, and I am extremely lucky that I can try to do for my students what a PC education did for me. Providence has changed a lot since I first drove through the Huxley gate. I’m sure you’ve noticed the physical improvements every time you have been here. And there’s a much greater emphasis on research than ever before. As a college, we’ve invested a significant amount of time, money, and energy into supporting faculty and student scholarship. Thanks to the generosity of so many in our community, this has paid immense dividends — testaments to which we see in college rankings, student success in graduate school and career development, and a growing international reputation for our outstanding faculty. But we’re still a teaching institution at heart, and the emphasis on research has breathed new life into the kinds of active, engaged educational opportunities we can offer to future generations. Teaching remains at the core of who we are and what we do in and out of our classrooms. As we begin PC’s second century, we will continue to offer a transformative, world-class education with the best professors around. Want proof? Just take a walk down our hallways. Andrews is an associate professor of history at PC.